CHRISTOPHER DAVIES is a veteran football writer who paid 17 shillings and sixpence to be at Wembley for the 1966 World Cup final. 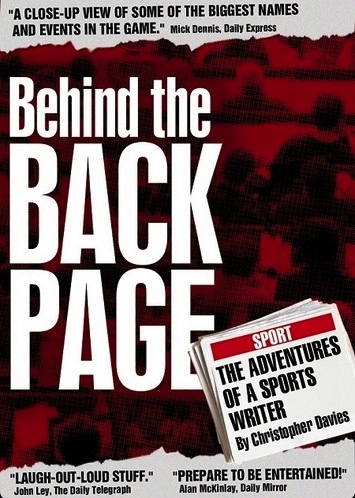 A former chairman of the Football Writers’ Association, he is the current editor of FootballWriters.co.uk and the author of ‘Behind the Back Page: The Adventures of a Sports Writer.‘ Here he argues that it’s about time referees were given the respect they deserve – not least by critics who don’t even know the laws of the game themselves. THE saddest development during the 20 seasons of the Barclays Premier League is the introduction of safe cars to take match officials to and from stadiums. We are not talking the royal family, high ranking members of parliament, overseas dignitaries or those who could be a target for extremists. We are talking the referee, assistant referees and the fourth official of football matches, but such was the danger to their personal security the Premier League decided the quartet should meet at a nearby hotel and be driven to the ground. And back again afterwards. Referees, inevitably, were targeted by irate fans who believed they, not the players or manager, were responsible for their team’s defeat. Forget the three missed open goals or the failure to defend a corner – what about the foul in the build up to one of the other side’s goals? Supporters decided to take revenge on the men they had been told cost their club three points. One referee, whose car was being rocked by angry supporters, drove through a red light for safety reasons. Others were manhandled in car parks after matches or abused in the street. Why? Because managers, invariably losing managers, have brainwashed fans into believing that the reason for the defeat was the referee. Tell anyone the same story over and over again and they start to believe you. Not just in the Barclays Premier League, but at junior and even schools level. Lose and it’s the ref’s fault. Sir Alex Ferguson, a serial referee critic, would probably deny his words and those of his managerial colleagues have caused such problems, blaming the acts of violence towards officials on fans. In no other sport do match officials come under such scrutiny or face a regular barrage of criticism and blame each week. Read the Sunday match reports and count the “ref blasted” headlines. Of course, just about every decision made by a referee is subjective. They are made by the most (only?) honest person on the field based on years of experience, starting with learning the Laws of the Game and then, like players, working their way up the football pyramid. The referees on the elite list are the best in England, but managers belittle them, criticise their weight and eyesight, doubt their integrity and impartiality with the result the man in black (or red, or green…) has become a discredited figure, a man who doesn’t know what he’s doing. The Respect campaign of the Football Association is little more than lip service. Is it respectful for a manger to say: “Of course, had it been at the other end…” or “he was never going to giver us anything today?” That is suggesting the referee is biased against one team and having worked closely with match officials over the past 25 years I can assure you that is not the case, though such is the mindset of supporters they genuinely believe the referee is against their side, unaware that he can’t be anti BOTH teams. It would help the credibility of those who criticise referees, be they managers, players, fans or, whisper it, football writers, commentators and pundits, if they were on first name terms with the Laws. A little knowledge can be a very dangerous thing and because so many, ahem, experts have told us this is the case, the belief is that a defender must be sent off if he is the last man and illegally halts an opponent. The fact that this is not the primary consideration* for the denial of an obvious goalscoring opportunity has been lost in a sea of misinformation. Managers are happy to go on television after a game, correction, after a defeat and say the referee got it wrong when, like Mike Dean at Old Trafford last month when he allowed Jonny Evans’ own-goal against Newcastle, he got it right. The opinion of a manager is taken as fact so even though the ref is correct, he’s still wrong. In football people are paid to say this; no they really are. Drivers would not take kindly to someone who has not passed their test criticising the way they drive, but it’s OK for somebody who has never been within a mile of a referees course to tell a ref he doesn’t know the Laws. Yes, match officials make mistakes and many should not occur at the highest level. But referees have one angle from which to make a split-second decision in the heat of the battle. The rest of us watch slo-mo replays from six different angles before coming to the conclusion the decision was harsh/wrong or a player was a good three inches offside. In the National Football League (NFL) coaches and players can say pretty well what they want after matches, but in the land of the free they are not allowed to comment on officials. It would be interesting if, for a month, football agreed to a referees blackout where those who play or manage are banned from talking about those who control the game. This would mean an acute shortage of back page stories and, heaven forbid, we might even have to write about the game.